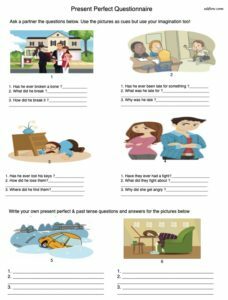 This is a present perfect exercise and worksheet for English language learners. Students answer the questions with their own ideas and using appropriate tenses. For the last two items, they write both questions and answers. 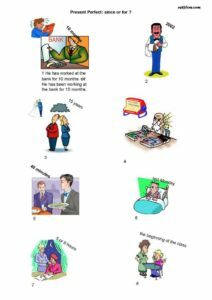 This is a present perfect exercise for English language learners to practice using “since” or “for”. Students use the time cues in the pictures to write complete sentences in the the present perfect tense. Click on the image below or the link to download the PDF file. 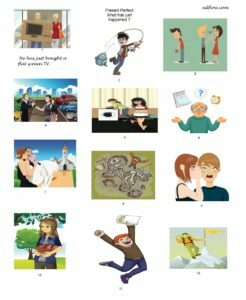 This is a present perfect exercise for English language learners to practice using the present perfect to talk about common experiences. 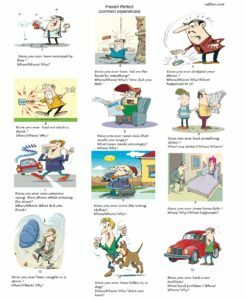 This is a present perfect exercise for English language learners to practice using the present perfect to talk about events that have just happened (a past event affecting the immediate present). Students use the picture cues to write appropriate sentences. 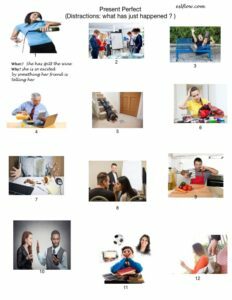 This is another present perfect exercise for English language learners to practice using the present perfect to talk about events that have just happened (a past event affecting the immediate present). Students use the photos of actions/events to write appropriate sentences. This is amazing work – and saves me so much time! Thank you for sharing! Cool. Really to happy get some feedback like this.